Influenza, also known as the seasonal flu, is an unpredictable and highly contagious viral infection of the nose, throat and lungs. These viruses travel through air droplets when an infected individual coughs, sneezes or talks. It can spread when someone inhales the air droplets or touches infected objects, transferring germs. Health Canada recommends that the best way to prevent influenza is by getting a flu shot. Dr. Susan Waserman, Chair of the Medical and Scientific Committee of Asthma Canada, especially encourages people with asthma and their families to get a flu shot yearly to help prevent complications with their chronic condition. 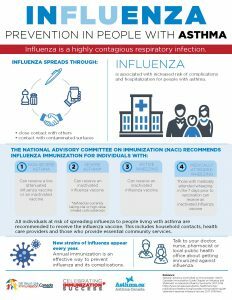 It’s also important that anyone who is a caregiver or health worker for vulnerable populations should take the flu shot to protect themselves and those they care for. A High Dose flu shot should be taken by those 65 years of age and older. Getting vaccinated is your best defense against the flu – for you and those around you. 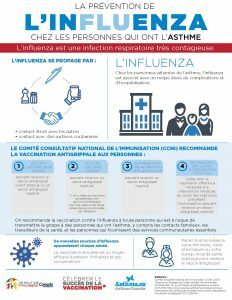 For more information about the annual flu vaccination, and whether four-strain of High Dose vaccine is available in your province, speak to your doctor, pharmacist or local Public Health authority.